Can you laugh when you are revisiting the trauma of your childhood – or when your only son dies? Can you laugh when your wife has just a few weeks left to live and she wants to put up a picture that both of you can laugh at so her passing will have a deeper meaning than just sorrow? Would you have the courage? Would you feel as though you were being insensitive and callous? Or could you, like the authors of the following books, see laughter as a way to help you get through impossible times – a way to keep sane and keep from falling in the abyss. The authors of the following books are testimony to not only our need to laugh but to find healing within its grasps. 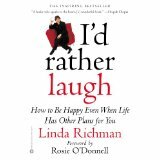 “I’d Rather Laugh”, by Linda Richman tells a personal story of trauma and intense emotional pain and how learning to laugh through even the greatest of these pains, not only helped her survive but to heal. It is a moving story that all of us can identify with and know that there is hope and healing from any pain. 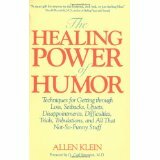 “The Healing Power of Humor” by Allen Klein, is an older book, but well worth the time to read. Not only does he share his own story, but tells us why it is so important that we learn to laugh and gives us tips on how to get through “loss, setbacks, upsets, disappointments, difficulties, trials, tribulations and all that not-so-funny stuff”. I learned the subtle skill of humor from my husband who could find humor in all things while being sensitive to the space of another. My upcoming blogs will be on laughter and the healing power of humor – how we can apply it to our lives and how it can help us overcome even the greatest of tragedies and give us the ability to move forward.